Meiosis is reduction division that occurs only in germ cells where gametes are produced with half the chromosome number to that of the parent cell. This reduction is essential for maintenance of chromosome number in a species. It occurs only in germ cells to produce gametes. We are 99.99% similar in genetic makeup according to human genome project. This diversity is contributed by just 0.01% of the genome. One of the major reasons for this variation is crossing over that takes place in germinal cells during gametogenesis. In humans, gametes are formed by meiosis where the chromosome number is reduced to 23. therefore, egg (23 chromosomes) + sperm (23 chromosomes) = zygote (46 chromosomes). Chromosomes condense , homologous chromosomes synapse, crossing over takes place, nuclear envelope break down and mitotic spindle forms. Homologous pairs of chromosomes line up on the metaphase plate. Two chromosomes of each with two chromatids of each homologous pair separate and move toward opposite poles. In some cells the spindle breaks down, chromosomes relax and a nuclear envelop re-forms, but no DNA synthesis is takes place. 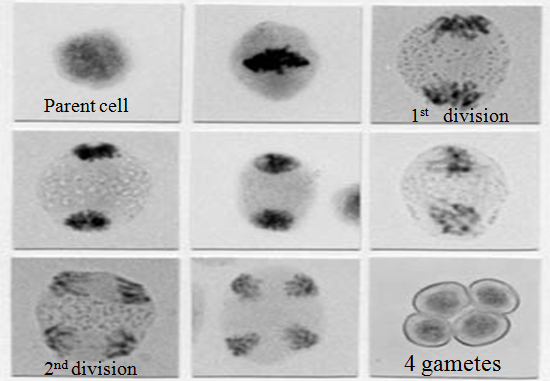 Chromosomes condense, the spindle forms, and the nuclear envelop disintegrates. Homologous chromosomes: Each pair of a chromosome in a diploid cell has one chromosome derived from the male parent and the other from the female parent. They are morphologically and genetically similar and are called homologous chromosomes. Synapsis: The process by which homologous become joined to one another during meiosis. Synaptonemal complex (SC): A ladder like structure composed of three parallel bars with many cross fibers. The SC holds each pair of homologous chromosomes in the proper position to allow the continuation of genetic recombination between strands of DNA.